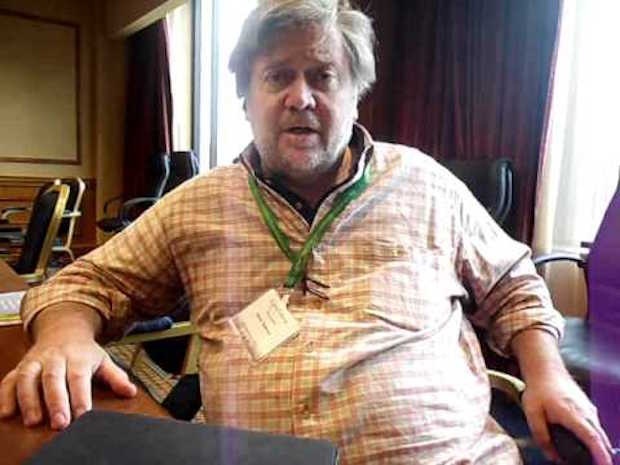 Steve Bannon shares a believe in genetic superiority with his boss. …Trump has repeatedly connected his success to his “good genes,” as ThinkProgress previously reported. He’s said that his children “don’t need adversity” to build character or skills, because they share his good genetics. In an interview once, he went so far as to compare himself to a “racehorse” and discussing his “breeding” at length. No surprise here, that’s a point so dear to fascists. Hmmm, beer gut and a red nose, seems like the superior race has a lot in common in the guys who are at the bar every night at 5pm for happy hour trying to goose the staff. he looks like a drunk chester chester the child molester. i bet his genes includes his mommy who is also his sister and his brother who is also his uncle. There should be a glass of CHEAP Whiskey in IT’S Hand. What gene pool are they referring to? They do not resemble the fellow humans I would refer to as superior in our gene pool such as Jesus, Buddha, Muhammad, Gandhi, Martin Luther King Jr., John Kennedy…..
Sue, ya got it wrong – there was caligula and atilla and hannibal and napoleon and hamilton and the entire american southern bureaucracy – all very very smart – smart has no relation to capability – sad though. I would never say all you need is to be smart to be at the top of our gene pool, the people I listed are also able to understand others and do not concern themselves with their own wants. Their is a large group of adjectives to use to describe this group, not just “smart”. But T. Rump doesn’t like genes. They are too tight and you can’t get a Good Grip. Or is that Jeans ??? Move over ISIS. T. Rump is in town. Trump connects his success to good genes?I connect his success to being born into wealth,and receiving several million dollars from daddy.Most all,if born into a rich family,will become successful,having nothing to do with heritage. so did thomas jefferson and a large number of your founding fathers along with hitler. Nothing new here – it’s an old american tale. Genetic Superiority, Isn’t that the EXACT THOUGHTS of Adolf Hitler ????? ?